Nothing beats feeling energized, happy, healthy, with no runny nose or cough every minute! Yes, I was sick. Well, still sickish.. But just the leftovers now. Pretty sure I'll be up to my normal self by tomorrow. Got this vintage dress from BonVieux about two months ago and never got a chance to wear it until now. Excited! I love the tiny tiny floral prints and the ruffles at front. It's the little things indeed. 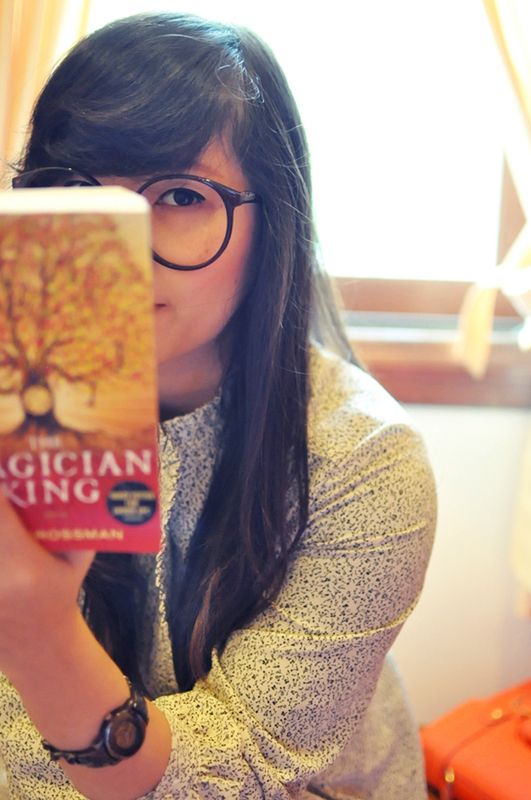 Decided to get my geeks on with the glasses and the novel. Just a few more chapters to finish. Personally, I love the story-line and the characters. Especially the two main characters, Quentin and Julia. Both outstanding magician and both super messed up. Kinda make me feel good about myself. Kinda make me feel it's okay to be human. To make mistakes, take the wrong quest, fall in love, fall out of love, to get lost in order to find yourself. Isn't that what we are all doing anyway? To find our true self and to be brave enough to be that person when we finally got it all figured out. Just another silly musing. I think too much unimportant stuff as per usual. Hopefully everybody is having a magical midweek! Oh my, this is like the n-th time I've said this, but you look really adorable in geeky outfits :D I love every single detail of it, the little bow on the belt, your glasses, those wedges and the pattern of the dress. Pure love. Hope you're doing well honey! "To make mistakes, take the wrong quest, fall in love, fall out of love, to get lost in order to find yourself." is not an unimportant muse, it was exactly what I learnt most importantly to survive in this young age. I suppose you'd definitely love to read Coelho's "Eleven Minutes" or "By The River Piedra I Sat Down and Wept". And ah, I've never heard of that book before. Will have to check it out! the dress is so pretty, and love your geeky and chic glasses! Oh I love the print of your dress. You look positively darling!